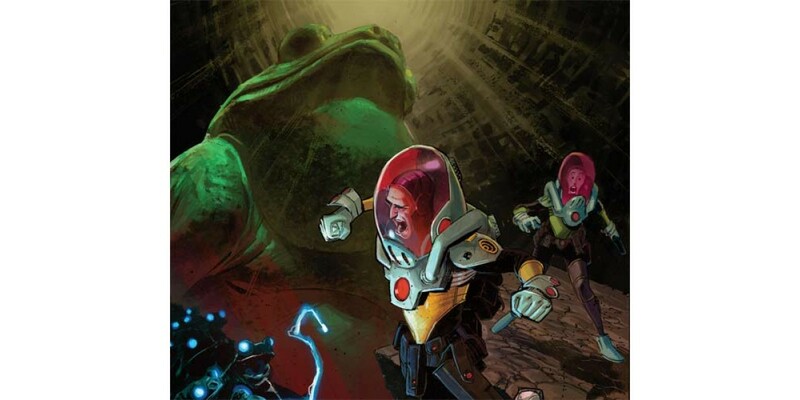 Remender, Scalera & White melt minds in their new sci-fi epic—only from Image Comics! Prepare yourselves: writer Rick Remender, artist Matteo Scalera, and colorist Dean White are ready to unleash BLACK SCIENCE #1 on the world. Grant McKay, former member of the Anarchistic Order of Scientists, has deciphered Black Science and punched through the barriers of reality. Now, trapped in an infinite ocean of alien worlds, Grant must find a way to get his team home safe and intact. "I think it's best described as VIVID. No. VIVIDLY WILD, with drama and humor. The art by Matteo Scalera is stunningly beautifully fluid and imaginative. And the masterful Dean White's color palettes and textures create an atmosphere of a dream-like lush. You must read this!" "Just a big pure vision of science fiction wonderment. Comics to paint the inside of your eyelids with." The latest hot release in a year of sell-outs, massive critical acclaim, and record-breaking sales from new debuts from Image Comics, BLACK SCIENCE #1 is sure to be in high demand. To celebrate the release of BLACK SCIENCE #1, Image Comics will be offering a blank sketch cover of BLACK SCIENCE #1 to retailers to pre-order with Diamond Code SEP138247. This will be the last blank sketch cover produced by Image Comics in 2013. BLACK SCIENCE #1 features two regular covers for pre-order, with one by the art team of Matteo Scalera and Dean White (SEP130471) and the second featuring a sci-fi novel-inspired cover by Andrew Robinson (SEP130472). BLACK SCIENCE #1 goes on sale in print and digital on November 27, 2013. Final orders are due to Diamond by comic retailers on November 4, 2013.